NEW YORK -- Columbus Blue Jackets right wing Rick Nash, Colorado Avalanche defenseman John-Michael Liles and Detroit Red Wings defenseman Brian Rafalski have been named the NHL 'Three Stars' for the week ending Nov. 21. Nash led all goal-scorers last week with six, including a pair of game-winners, as the Blue Jackets (12-6-0) swept a three-game trip through California for the first time in franchise history. Nash scored two goals, including the game-winner, as Columbus handed the Los Angeles Kings their first home loss of the season, 5-3, on Nov. 17. He added a goal in a 4-3 win at Anaheim on Nov. 19 before collecting his fifth career hat trick, including the game-winner, and firing eight shots on goal in a 3-0 win at San Jose on Nov. 20. 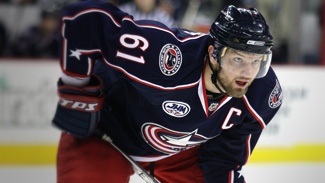 The Columbus captain enters tonight's game against Nashville riding an eight-game point streak (9-3--12), a five-game goal streak (8-1--9) and season totals of 12-4--16 in 17 games. Liles tallied seven points (two goals, five assists) and a +5 rating last week, helping the Avalanche (12-7-1) post four consecutive victories and take the Northwest Division lead. Liles tallied two goals and one assist in a 6-3 win over the St. Louis Blues Nov. 15, his first multi-goal game since Oct. 18, 2006 at Toronto. He notched two assists in a 4-3 overtime victory over the San Jose Sharks Nov. 17 and closed the week with two more assists in a 4-3 shootout win over the Dallas Stars on Nov. 20. The 29-year-old Indianapolis native is tied for the NHL scoring lead among defensemen with Detroit's Nicklas Lidstrom (3-17--20) and tops the Avalanche in assists, plus-minus (+11), average ice time per game (22:29) and blocked shots (39). Rafalski notched seven assists in three games as the Red Wings (13-3-2) earned five of six points, closed their six-game homestand with a 5-0-1 mark and moved into first place in the Western Conference standings. Rafalski began the week by matching a career high with three assists in a 7-3 victory over the St. Louis Blues on Nov. 17. He recorded one assist in a 4-3 overtime loss to the Minnesota Wild Nov. 19 and collected three more, including the 400th of his NHL career, in a 5-4 overtime win over the Calgary Flames Nov. 21. Rafalski has recorded 10 assists in eight games this season.